As the fourth month of Operation Sinai 2018 draws to a close, residents of North Sinai have begun to see an improvement — albeit a slight one — in their living conditions. The goods and services cut off with the commencement of the campaign have come back into circulation, but those living in the surrounding villages are still suffering, residents say. Transportation and freedom of movement remain restricted for all, both within the governorate and between the governorate and the rest of the country. The vegetable shortage was resolved following the March 28 presidential election, goods are available in abundance and people are no longer queueing for hours to buy necessities, according to several residents who spoke to Mada Masr. Throughout February and March, Armed Forces mobile outlets were the sole supplier of food items — including meat, frozen poultry and vegetables — for people in the cities of Sheikh Zuwayed and Arish. In April, a limited number of privately owned suppliers were able to access the governernorate. And in more recent weeks, merchants tell Mada Masr that the North Sinai Governorate has offered a means by which to transport goods into the area from surrounding governorates via the Arish Chamber of Commerce. The new mechanism requires merchants to delegate a representative who will liaise with the chamber, submitting a file on behalf of each seller that includes a list of the goods they intend to bring in, alongside the names and license plates of their drivers. Each merchant is then assigned certain days of the week on which they are allowed to carry out deliveries. A few days before Ramadan, North Sinai Governor General Abdel Fattah Harhour inaugurated two fairs in the cities of Arish and Bir al-Abd as part of “Ahlan Ramadan” (Hello, Ramadan), a government-organized campaign to provide residents with food items for Ramadan meals. At the inauguration of the Arish fair on May 10, the governor stated that the campaign would remain active until the end of the holy month, if the products it was offering were found to be in demand. The main streets and markets of Arish had become sites of bleak inactivity with the start of Operation Sinai 2018, as the campaign discouraged citizens from leaving their houses, especially at night, for fear of becoming target to terrorist attacks. However, the fair brought with it a noticeable uptick in activity, with life returning to July 23 Street, one of the city’s main thoroughfares. Independent vendors also pitched their stations outside the fair, offering a variety of merchandise, from plastic household items and second-hand clothes to Ramadan lanterns. Despite the regained liveliness of the town center, some traders — owners of clothing and shoes outlets in particular — say that this is not fully indicative of residents’ purchasing power. While things may have been looking up for townspeople, the villages on the outskirts of Arish and Sheikh Zuwayed and those south of Rafah have yet to see any improvements. Residents of the buffer zone on the border with Palestine — those of them whose homes were not demolished — are no luckier. Accessing food is extremely challenging for residents of Sabil (south of Arish), Karama and Amal (east of Arish), as is finding transportation in and out of the villages. Upon the launch of Operation Sinai 2018 in February, the roads to all villages east and west of Arish were blocked for motor vehicles, forcing village residents to walk long distances to buy necessities. Horse-drawn carts, which had become the only remaining transportation option, were torched by security forces, according to residents, making life even more difficult for those on the peripheries of the governorate’s capital. For over two years, the carts had also been the primary means of transportation between the villages around Rafah and Sheikh Zuwayed, since security checkpoints began to deny passage to motor vehicles. The handful of people still living in the three Sheikh Zuwayed villages of Abul Arag, Dahir and Jura now face an arduous journey, on foot, to the food and vegetable market in the town’s center. The road there is several kilometers long and is dotted with sand barricades. Rafah villages are suffering a similar situation, especially those located beyond the barbed wire fence that was installed by the Armed Forces to separate the buffer zone along the border with the Gaza Strip in May. The few families that were not evacuated from the buffer zone now find themselves forced to make a similarly strenuous trip, as they too are forced to walk to Sheikh Zuwayed to buy groceries. North Sinai Deputy Supply and Internal Trade Minister Fathi Rashed told the London-based Al-Hayat newspaper at the end of May that all of that month’s rations had been dispensed to ration card holders. He added that June rations had also been stocked and were ready for issue at the start of the coming month. Yet, residents of central and southern Rafah villages tell Mada Masr that they have not received their flour rations for the month of May. The villages south of Sheikh Zuwayed have also been without water or electricity for three months. The sole source of power has been a small number of generators, which operate for a limited number of hours each day. Early in May, the Armed Forces allowed Arish cab drivers, whose taxis run on natural gas, access to fuel, granting them 10 liters of gasoline every 15 days. The decision alleviated the difficulties of limited movement that Arish residents had faced for three months due to the restrictions placed on fuel for private cars and taxis. For Mohamed Salama, a taxi driver, the decision was long awaited. “There are a lot of households that are supported by taxis, and the months-long idleness has been financially devastating,” he tells Mada Masr. New regulations have been put in place in the city to regulate the supply of natural gas and gasoline. “Each vehicle may be filled up [with natural gas] once or twice a day and gets 10 liters of gasoline once every 15 days,” Salama explains. Nevertheless, taxis are now back facilitating movement between central Arish and remote areas and neighborhoods. From February through May, the sole means of transportation between central Arish and these areas were small, diesel-powered pickup trucks. The fare for a trip ranged between LE5 and LE10 per person or LE50 and LE100 for shared rides, depending on the distance traveled. With the shortage in fuel, a black market emerged, where gasoline and diesel are sold for more than double their actual prices. The driver of a small pickup truck tells Mada Masr that the black market diesel and gasoline were supplied by owners of fishing boats. The ban on fishing activities that was imposed in conjunction with the launch of Operation Sinai 2018 had cost them their livelihoods, so the idle fishermen decided to sell their fuel supply to make money. The blackmarket fuel was also supplied by owners of heavy-duty trucks, whose activities had ceased during the military campaign, as roads and highways were blocked, according to the trucker. But in late May, drivers began to face difficulties at the only natural gas station in Arish. Two drivers attributed the problem to the military-commissioned officer who was in charge of securing the station. According to them, he “mistreated” drivers and closed the station at arbitrary times, causing lines — up to four kilometers long — to form down Assiut Street. This was documented by a citizen in a video posted on Facebook. The officer in charge limited the supply window to the four hours between 8 pm and midnight, according to the two drivers. He forced drivers to wait in line all day to fill up, which left them to eat iftar and suhour, as well as sleep, in their cars. At one point, a driver grew impatient and tried to cut the line. The officer intervened, handcuffing the driver and ordering him to stand on top of his car for four hours, as reported by the Facebook page Wafd in North Sinai. Another video emerged of individuals in Armed Forces uniforms beating a driver at a fuel station in the town center, near Nasr Square. 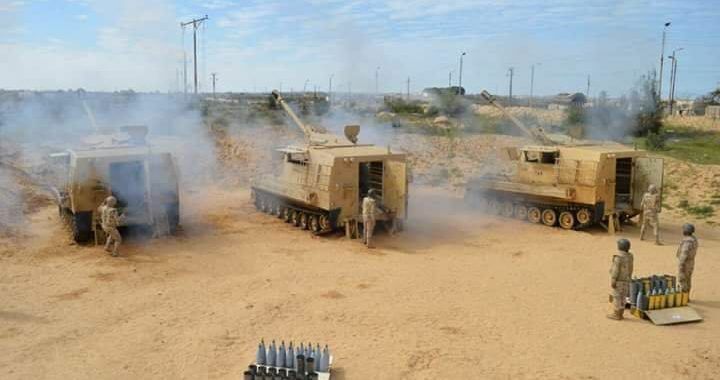 The footage circulated on social media and enraged Arish residents. In response, top military brass in the governorate removed the commissioned officer from his post at the gas station and reassigned him. The soldiers stationed in Nasr Square were also reassigned. On May 30 and 31, the fuel station located in Nasr Square offered a one-time supply of 10 liters of gasoline to all private cars. The resulting lines caused a traffic jam in the town center. Early during Operation Sinai 2018, drivers could buy 10 liters of gasoline every few days, as long as they had a voucher issued by the supply directorate, the administrative office at the governorate, or Battalion 101. During a Sunday press conference that was attended by the North Sinai Governor General Abdel Fattah Harhour, Brigadier General Sherif al-Araishi, and the chief of staff for the North Sinai security sector, it was announced that private cars would be allowed a ration of 20 liters of gasoline once every two weeks and taxis would be allowed a 30-liter ration until the military operation concluded. Two Arish fuel station owners confirmed that the supply directorate instructed them to prepare to reopen their stations and informed them that they would be provided with the necessary supplies to cover the following few days. Since the launch of Operation Sinai 2018, Arish and Sheikh Zuwayed residents and those that remain in Rafah were required to secure advanced registration with the security authorities to enter or exit the governorate. By early May, the restrictions on travel were informally alleviated — some residents were able to travel in private vehicles without prior coordination with the governorate authorities. “Ultimately, it depends on the officer manning the Balouza checkpoint for those entering the governorate, or the one manning the Midan checkpoint for those exiting Arish,” residents tell Mada Masr. They say that traveling has become significantly easier since the start of the week. Meanwhile, the North Sinai governor announced that citizens will be allowed to travel freely on Thursday and Friday of every week without prior registration with the governorate. However, residents still have to secure prior registration, despite the special Thursday and Friday facilitation. Anyone who wishes to travel has to register online or visit the governorate’s administrative office to submit their name and a copy of their national ID card, and then wait for approval. A list is regularly released through North Sinai Governorate’s official Facebook page, along with the date, time and designated meeting point for the corresponding batch of travelers. Shuttle busses are chartered by the governorate to drive them to the neighboring governorate of Ismailia. Private cars, on the other hand, are still barred from traveling by the security authorities, with possible exceptions for medical patients. To be granted permission to drive a patient in or out of the governorate in a private car, an application must be submitted that includes the license plate number, the driver’s license number and copies of the national ID cards of the patient’s attendants. The date for travel is then determined by authorities, and a voucher is issued to buy 10 or 15 liters of gasoline to cover the trip from Arish to Qantara Gharb in Ismailia. These processes take time, however, and people wait for weeks, and sometimes months, to secure approval. Huda Mohamed and Khaled Samir, two other residents, report a similarly long wait time. Their friends, however, were allowed to travel just days after they registered. Others bribed bus drivers to get through without prior coordination. Originally LE20, the bus fare skyrocketed to LE120 and even LE200 following the launch of the military campaign. But advanced registration and the long wait to make the list are not the last of travelers’ troubles. The trip that should take no more than two and half hours now takes 10 hours. An Arish woman documented her experience on the trip from her hometown to Ismailia. Telecommunication networks and internet services have been available around the clock, an unusual state of affairs for North Sinai. Since the presidential election in late March, interruptions are few and far between and only last for a few hours at a time. Meanwhile, the sounds of explosions and cannon fire that used to shake residents’ houses in the early stages of the military campaign are no longer heard. Joint military and police raids are still ongoing, in which Arish neighborhoods are surrounded and mobile phones and tablet computers are confiscated from residents. The police have, however, recently begun to return devices that had been confiscated early on in the operation. It was only via Facebook that Arish residents were alerted to the fact that their phones were now available to be retrieved. No official statements were released by the governorate or the security directorate general. A young man from the southern Arish neighborhood of Salayma tells Mada Masr that he heard about the decision via social media. The following day, he went to the Third Arish District Police Department, where his family’s phones were handed back to him. Salayma was one of the first areas to be targeted in the early stage of the military campaign. It was surrounded, along with the other neighborhoods in the southern part of city. When confiscated by the forces, he says, the phones belonging to each family were bundled in a small plastic bag and the names and national ID card numbers of their respective owners were noted down on a list that was placed inside each bag. He also tells Mada Masr that residents of his area have since retrieved their phones.